RoyalEnfields.com: Kawasaki W800 competition for Royal Enfield? 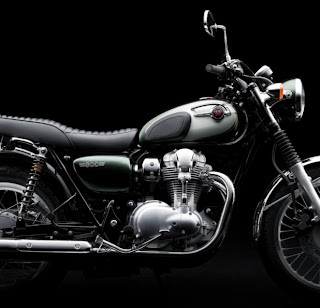 Kawasaki W800 competition for Royal Enfield? Royal Enfield's success with its new Classic 500 (called the C5) is certain, in India. It will no doubt sell well enough around the world to justify the company's faith in it. Success brings competition, naturally. Blogger Jorge Pullin spotted the video of the 2011 Kawasaki W800, a British styled motorcycle, on the Visual Gratification blog, which lists the W800 as part of a wave of new classics being offered from Japan. The Kawasaki looks terrific; better than most of the real British bikes looked in the day. Ironically, the video opens with the wheezing sound of the electric starter. The video carefully avoids showing much of the right side of the motor; there's no kick start lever. Hardly worth mentioning the omission (the Royal Enfield C5 we get here in the U.S. doesn't have one either) but it's amusing that Kawasaki tries to hide that. Kawasaki briefly (two years, 1999 and 2000) offered its W650 in the United States. It was a Brit-style motorcycle (with a kick start). They were much admired. Here's a picture of one, for sale in Montreal. "Rubber mounted engine for vibration, the sound, look and feel of a British bike without the hassles. A dream bike (I have two and am reducing my collection to one)," the seller writes. So, Kawasaki can claim to have done this all before and done it well. But it's so easy for the big manufacturers. They can enter any market with outstanding products made to order at attractive prices. Yawn. A Brit-bike? Sure; I'll have the design for you on Monday. Honda's line-up recently consisted overwhelmingly of Harley-Davidson style cruisers — the very motorcycles Honda had put in the shade in the 1960s! Here's my point: what do these companies stand for? If these are the kind of motorcycles they make, why haven't they made them all along? Are the "new classics" competition for Royal Enfield? Royal Enfield is secure as long as its motorcycles continue to be hugely popular in India, an expanding market of millions. Internationally, it probably can get by catering to lunatics like me, who want motorcycles that genuinely evoke the experience of another era. But the power of Kawasaki to introduce the W800 must surely put a cap on Royal Enfield's ambitions when it's suggested that they "bring back" the Interceptor. Too late. It's back. Kawasaki makes it. Trim off the extra bits and it could make a really nice cafe racer. But I was just thinking about this on my ride home last night: I LOVE the sound of my Enfield. This ad makes the Kawasaki appear to make almost no noise which really reduces the personality. I had two 2000 W650s. One that I sold my 1960 El Camino to purchase new. Unfortunately it was stolen with just 1500 miles on it. The other I bought used a few years later and have since sold. Kawasaki brought them in too early for the retro bike craze, and they sold poorly. Now its ten years later and there is a large market for the classic British bike style. They are very nice bikes, but lack the soul of the Royal Enfield. That is really a nice bike. I bet it cost much. and click on the link to listen to the sound of the bullet. Its heart beat.....try to beat that! Here's a strange thing, that video is shot in and around London (the music shops in Denmark Street are just around the corner from where the front cover of the "Ziggy Stardust" album was shot,) but at the end you can see the bike has German registration plates. So is it a Brit style bike or not, Mr Kawasaki?! David, your point about "competition for the RE" is kind of moot here in the USA because Kawi hasn't announced any plans to bring the bike here. "retro" Triumphs and the various models of H.D. Sportster. For better or worse I think that the R.E. appeals to and will continue to appeal to a diffferent demographic. here in California. But it doesn't really exude the charm of the past.. I own both Kawasaki W650 and a 2002 RE 350 Classic. Usually choose to ride the RE and here's why. The W650 is too large; up to 15% larger than the '60's era Triumph or BSA after which it is patterned. So what you say; well here's what! The W handles ponderously when compared to the RE. The bottom-line is that the RE is a joy to ride and the W is not. Now for those of you who say,"Well that was the W650 and not the W800. The bikes are identical save for the additional 98cc's and a modified shape given to the tank. All that said, the W800 might give our friend Kevin&Co. competition if Kawa decides to sell the W800 in the US at the right price.